These days, we need to play the hand that we were dealt which is low-interest rate environment. To get decent returns, you have to invest in equities. That’s where dividends come in to create a compound growth return. Compound growth is a simple mathematical concept but powerful when you let it ride for many years. Compound growth is really a simple formula and the concept is as follow. The interest earned on your principal is added to your principal to calculate the following year’s interest. Even if you don’t add any more money, your interest is bound to increase year after year since the previous year’s interest is also included in the calculations. While the definition of compound growth can be written in many ways, it’s essentially a mathematical formula covering a period of time as outlined below. The compound growth rate can simply be the interest rate of an account. See the example below on the results of compound growth applied to $1,000 over a 10-year period with various growth rates. While it’s nice to see how $1,000 can grow, lets’ look at the same example but we add $1,000 more every year. The benefits of compound growth are more prevalent with more money at work. It creates a compounding machine. You might be really interested in buying high yield stocks with 5% but that might not be the right choice. When it comes to stock, dividend stocks with DRIP allow you to benefit from compound growth while you sleep but you do not want to ignore growth from a dividend growth stock versus a high yield stock. The end game is total return for a higher annual rate of return. Compounding your dividend is part of the portfolio growth formula. The wealth triangle shows you the pillars of building wealth with your savings invested, a rate of return and time. Time is not really in your control but the other 2 variables are. The table below highlights what a growing compounding machine can do with your money. In the second table when you add $1,000 every year for 10 years at 2.00%, you end up with a total of $11,169. When you choose a dividend growth stock rubber stamped as a Dividend Ambassador, you can get an extra $1,044 in growth. It’s the equivalent of a starting growth rate of 3.60%. As you can see, the highest yield is not always the best. When you consider that the stock is probably going up at the same time, you can generate some really good returns. The rule of 72 is a simple rule of thumb to estimate how fast your money will double. You basically divide 72 by the interest rate (or growth rate) you have and it estimates the number of years it would take to double your initial capital. In my case, the growth rate is my dividend yield. To ensure you get the results, your dividend must be reinvested as the rule assumes compound growth. When you can figure out your compound annual growth rate, you can use it to assess how fast you can double your portfolio. They say the first million is the hardest, that’s because it takes less time to double the second one. Great dividend stocks happen to increase their dividend annually and some by 10%, such as the dividend ambassadors, and that makes it a bit harder to calculate the annual growth rate or the actual growth rate. 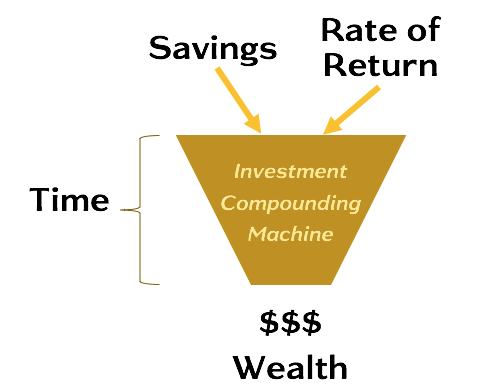 The Compound Annual Growth Rate (CAGR) which establishes your annual rate of return is what comes into play to derive the actual rate of return. CAGR is also known as XIRR in Excel (or other spreadsheets). It takes into account when you started the calculation, the amounts added/withdrawn over time and the current amount you have now to calculate your annual return. The simplest way to calculate your CAGR is to use a spreadsheet and use the built-in XIRR formula. You will need your investment account contributions and withdrawals with the dates as well as the current value of the account. To simplify my process, I put together a portfolio tracker to know exactly the performance of each of my accounts as well as my portfolio.